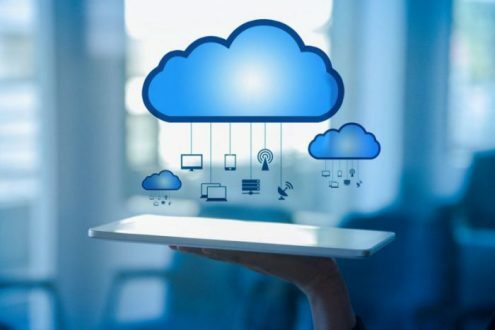 Cloud computing is the delivery of computing as a service rather than a product, whereby shared resources, software, and information are provided to computers and other devices as a metered service over a network such as Internet, being the most common among them. It is delivery model for IT services based on Internet protocols, and it typically involves provisioning of dynamically scalable and often virtualized resources. It is a byproduct and consequence of the ease-of-access to remote computing sites provided by the Internet. This may take the form of web-based tools or applications that users can access and use through a web browser as if the programs were installed locally on their own computers. Cloud computing really is accessing resources and services needed to perform functions with dynamically changing needs. An application or service developer requests access from the cloud rather than a specific endpoint or named resource. What goes on in the cloud manages multiple infrastructures across multiple organizations and consists of one or more frameworks overlaid on top of the infrastructures tying them together. According to the experts, cloud computing is the future model for providing IT infrastructure and services in large organizations. According to a report from Wanted Analytics, a talent research firm, the demand for cloud computing skills has exploded with hiring for cloud computing expertise growing 61 percent year over year. According to the report, over the past 90 days employers and staffing firms have placed more than 10,000 job ads that included cloud computing skills and experience as requirements. Those ads came from more than 2,400 companies in that 90-day period, which ultimately pushed cloud hiring demand 61 percent year-over-year. Solution providers are seeking cloud-ready employees to bring their IT businesses to the next level. Additionally, a host of major IT companies have launched cloud-specific certifications to arm the market with cloud skills and competence. The cloud computing market is evolving at such a pace that while the number of job postings is skyrocketing, the talent isn’t there to fill the positions. Among the most common positions that require cloud computing experience are computer specialists and programmers with expertise in web technologies, but the recent cloud boom has also created a major need for cloud expertise in software and cloud applications. Meanwhile, Wanted Analytics found that recruiting for cloud computing is likely moderately difficult and conditions vary based on talent supply and hiring demand per location.